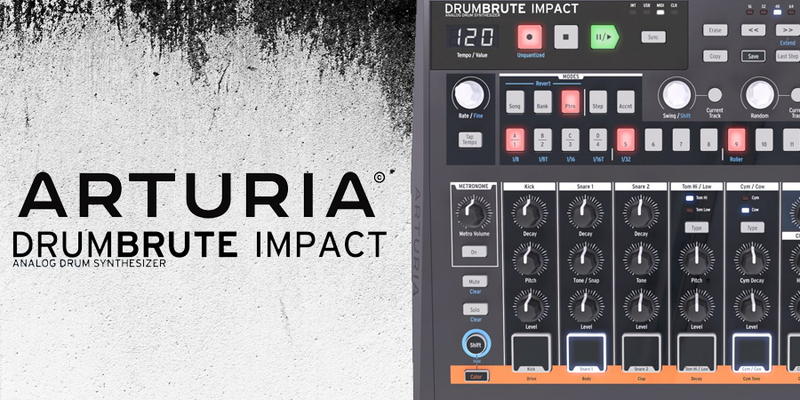 Arturia are really starting to get a feel for that their users want, sure they've made a couple of questionable Creations and additions to their product lineup recently....but that can all be forgiven with the announcement of the DrumBrute Impact. You might be asking yourself "but why?" and "what's different?" and let me stop you right there. DrumBrute Impact, whilst I shares a similar look to the original DrumBrute it is in fact completely re-voiced and sounds remarkably different. It's also a lot smaller and quite a lot cheaper at just £265. Impact contains 10 analogue voices, which are controlled by a remarkable sequencer (something which Arturia are well known for). The sequencer can do complex poly-rhythms in the same way you can on Beatstep Pro V2.0 and it also allows you to sequencer lock the colour settings for certain voices. "colour settings? what are they?" Well, a new feature to the Impact is the colour control, which effectively serves as a secondary voice for the main voice you're programming, this colour handles a different function depending on the voice you've selected and, as mentioned above, you can chose on a per-step basis, when that colour change takes effect. Very handy for making linear grooves and beats sound more alive. So how does it sound. Well from the videos I've watched so far...it sounds a lot like a meatier 808, have a look at the video below from MylarMelodies and see what you think? As you can probably tell from the video, the form factor is quite a bit smaller than the original DrumBrute, but somehow they've managed to cram in a group of dedicated outputs, analogue and MIDI sync, full size pots and full size pads for more expressive playing. 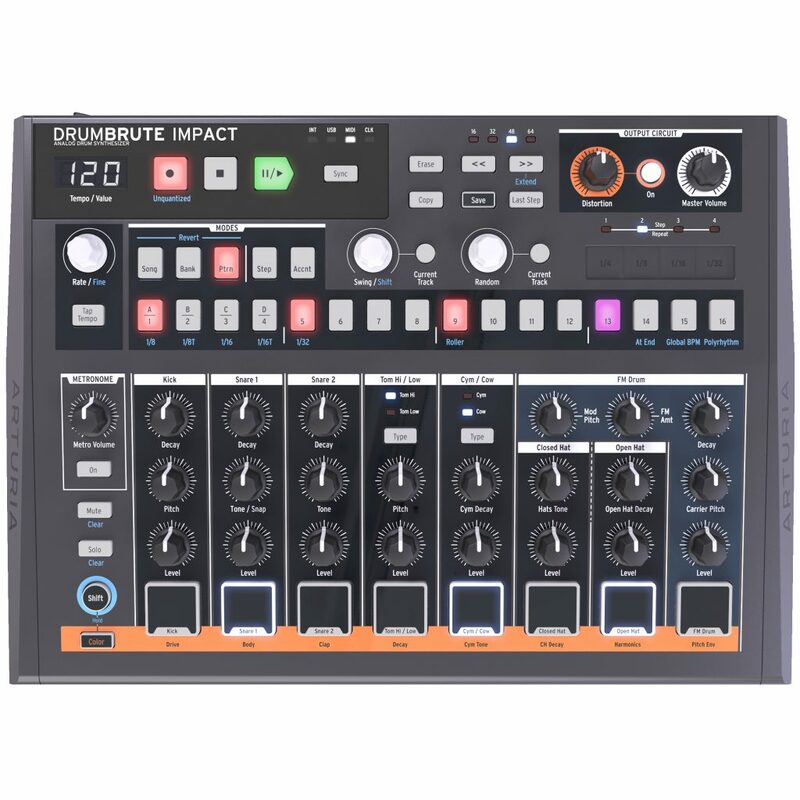 DrumBrute Impact is a very welcome addition to the drum machine world and is a superb option for anyone starting out or anyone that just wants a head-melter of a drum machine without destroying the bank. And it's just £265.....I'm always taken back how affordable it is to get into making music with hardware nowadays, when I started making music with hardware back in 2010 there really wasn't much around and now if you've got a couple of hundred quid, you can build a really great sounding setup and get playing out. Impact is shipping this Summer, for more information drop me (Synth-Tom) a line.